If you have ever used your bank to send money overseas personally or for your business, the chances are that the transfer has cost far more than it appears on your bank statement. You could be saving thousands every year. Banks often promote the set fee incurred on a money transfer, but the hidden cost is realised through the poor exchange rate offered. Banks will buy the currency at a particular exchange rate and then take a percentage of profit from that purchase price. This is called the spread or margin. So, the true cost of an international money transfer is the fee charged and the spread or margin taken by the provider. A currency specialist will perform better in both components of a money transfer and provide far better service. WorldFirst provide better exchange rates and charge no fees meaning our transfers are up to seven times cheaper than the big 4 banks. Customers also receive a dedicated currency specialist and can make transfers online 24/7. 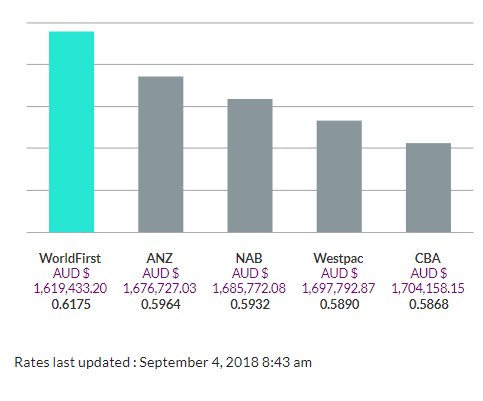 We’ve created an exchange rate comparison tool which instantly compares money transfers with WorldFirst and the big 4 banks. We used our exchange rate comparison tool to compare how much you could save on some of our most common transfer types. An Australian jeweller imports €1m worth of watches every year from Europe. 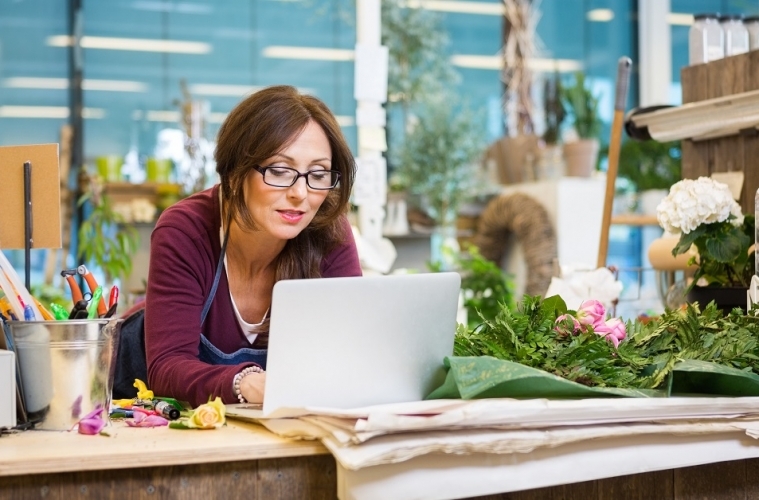 Instantly compare exchange rates online now to see how much you could save personally or for your business. All clients also enjoy award winning local service, no fees and have the ability to make transfers online 24/7 or over the phone. All pricing comparison data obtained and prepared by WorldFirst through online research and reflects daily rates as at the last update marked by time/date stamp. Based on transfers of AUD to GBP, AUD to USD, AUD to EUR, AUD to NZD and AUD to SGD (including inverse). Fees not included. 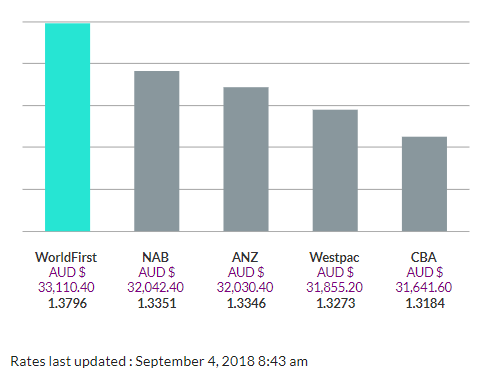 Big 4 exchange rates have been obtained from customer rates published publicly on websites of ANZ, NAB, CBA and Westpac at time stamped on page. 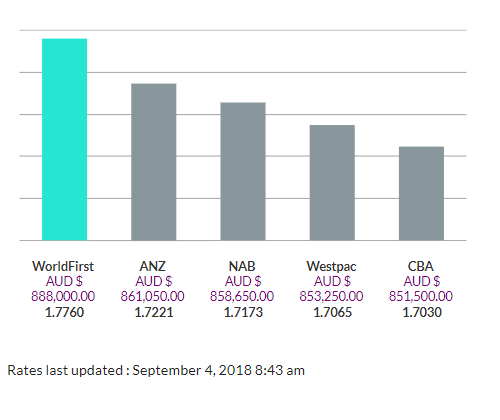 Rates in comparison obtained on Sept 4, 2018 at 8:43am. Whilst every effort is made to ensure the information is accurate, you should confirm the latest exchange rates with WorldFirst prior to making a decision. The information published is general in nature only and does not consider your personal objectives, financial situation or particular needs and is not recommending any particular product to you.